In my career (counting collaborations, 27 novels written so far and counting!) I’ve flirted with cyberpunk, dallied with hard science fiction, had a serious fling with space opera. I’ve dated around contrafactual fiction, urban fantasy, gaslamp fantasy, epic fantasy. I just can’t seem to settle down. And now I’ve written a Weird West steampunk book, Karen Memory. I’ve had colleagues caution me that I’m probably not doing my sales numbers any good with this ceaseless flitting. Settle down, they tell me. Find a nice series you can live with and make it work. You’re not getting any younger, and you need somebody who will be there for you when you’re old. And there’s a lot of validity to that. I mean, if I had kept writing Jenny Casey books, I’d probably be making a lot more money than I am now. But if I’d stayed on doing technical writing and administration, I’d be making more money than I am now. And I’d have to wear mascara every day. So I figure some of it is what I want to be doing. What sort of stories I want to be telling. I also comfort myself that the Roger Zelaznys and George R.R. Martins of the world can serve pretty handily as models of the sort of literary legacy I’d like to leave — eclectic, playful, but with certain things that tie it together. Likewise, I think there are thematic concerns and modes of characterization, for example, that I think mark an Elizabeth Bear book, and that can serve as a brand just as well as, say, “Big Idea Space Fantasy” could. I mean issues of ethics, the position of marginalized people in society, and the unexceptionalism of everyday heroism: people getting up and doing what they have to do for no better reason than because they have to do it. I also know that every transition may lose me readers — but it is an opportunity to find a new audience, as well. It’s an interesting conundrum. There are writers whose work I will read no matter what they’re doing — writers like Barbara Hambly — and other writers whose work I only like some of the time, on particular topics. So what do you think, folks? Will you follow a favorite writer across series? Are there some writers with whom you have tried, but you only like some of their work? Readers, comment below for a chance to win your own copy of Karen Memory. 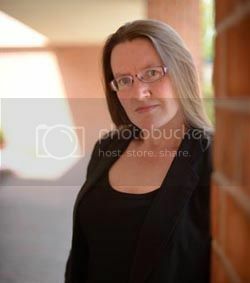 ELIZABETH BEAR was the recipient of the John W. Campbell Award for Best New Writer in 2005 and has won two Hugo Awards for her short fiction along with a Sturgeon Award and the Locus Award for Best First Novel. Now she returns after the conclusion her highly-praised ETERNAL SKY trilogy with a Western steampunk set in a reimagined 19th century Seattle in KAREN MEMORY, the unforgettable story of a plucky heroine risking her life for friendship. I’m willing to give an author a chance across genres, series, settings. It doesn’t always work, but I’m usually amenable to the attempt. I love when authors cross genres. I’ve found that unless the genre is way out of my wheelhouse, say to mystery, I am drawn to their style. For my favorites it has worked so far, I’ve gone from steampunk to horror to paranormal to urban fantasy and I’ve enjoyed blogs that I most likely would not have read. I’m often surprised at how good writers are when they write cross-genre. But, I’m still drawn more to some storylines than others. I enjoy authors that move across genres. Is frequently worth the effort and they tend to stay fresher longer. Definitely! When I love a writer, it is as much for their imagination, style, language, world building and character developement as it is for a particular genre or series. When they boldly go where no writer has gone before (possibly), I love to tag along. Always a Bear fan – I’d love a copy of this book! I love cross-genre authors: Zelazny, Hambly, Bujold, Rachel Aaron (and Elizabeth Bear, of course) are some of my favorites. After all, my reading taste spans genres…so it feels only logical to me that authors’ writing taste does as well. 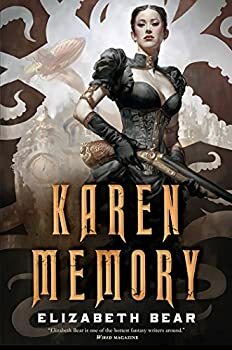 Can’t wait to read KAREN MEMORY! It’s a double-edged sword. Writing in multiple genres increases your exposure, and may draw in readers of genre X who would never read genre Y . . . but who just might try it now because they trust your style and imagination. At the same time, I can understand how readers who’ve become accustomed to you in genre X might feel a little cheated or betrayed by a shift in genres. In my experience, I’m more happy to follow authors who I’m accustomed to being polygenreous, because I’m comfortable with that diversity, than those who have always been defined by one genre and suddenly, inexplicably shift. I wonder if genre relativism (modeled on cultural relativism from anthropology) is a thing? I think I practice it in my choices of what to read. But yes, an author with a writing style that works for me will win every time when resources are scarce. I’m planning to read Karen Memory (although it’s really Memery, which is cool, and maybe based on “meme”). Is care & memory like tea & sympathy? I follow authors across genre pretty faithfully, but then I read almost every genre there is. What hooks me about an author is usually the way they tell a story and the characters they create, and most of the time (for me) the author’s voice transcends the details. You lead, & I will follow. That’s how I find new books that I otherwise would miss. This book is the first I’ve heard of Elizabeth Bear but it makes me excited to read more of her writings! I tend to read across genres anyway so a switch from a favorite author won’t phase me in the least. I’m happy to try something new and if it works, great, if not, I move on. No big deal. There are some authors that I’d be euphoric if they would branch out and write more in any genre that pleases them because I just would like to read more of their books but if they don’t, that isn’t a big deal either. Does that make me a polygenerous reader? I would read anything that Elizabeth Bear wrote. Even her grocery list. For me, it’s a question of whether I enjoy a genre and am therefore willing to follow an author on their adventures. There are some genres that I’ve tried and just can’t get into, so even if I’ve loved or liked an author’s work in (for instance) straight-up fantasy, I’m a lot less likely to try their urban fantasy work. Or I might feel that an author has a great voice in their Young Adult series, but their “serious adult fiction” offerings aren’t as compelling. But some authors have their hooks in my heart, and I’ll happily read anything they write. I read across genres anyhow so I’d try just about anything by an author I liked. I will follow a favorite writer across series and yes, sometimes it just doesn’t work for me. For example, there are some authors that make me fall in love with their paranormal or historical romance and then they start writing contemporary or new adult stories that just don’t interest me. One of my favorite writers has done several different types of stories, including YA, and I’ve loved them all, but I just haven’t been able to dredge up any interest in her latest offerings, which are new adult stories. I will follow most authors across genre lines, because I don’t just read one genre. Daniel Abraham being my favorite example – I’ve loved all of his books, and will read everything he writes. I will read anything Elizabeth Bear writes. Genre doesn’t matter to me, it’s the characters’ voices that matter, and EB always writes amazing characters. I would and I have followed authors as they have started other series especially if it is in a genre I read. I sometimes find it weird when people won’t try another series by that same author because “It’s not X series.” There are some series that I don’t prefer from authors, but that won’t stop me from trying other stuff by the same author. I would follow an author across genres and series. Off of the top of my head I have read Anne McCaffrey’s Pern books and also her DinoWorld booksand her Doona books, Larry Niven’s Draco series and his Known Worlds books. Does Michael Moorcock count with his Multiverse series? Several of them are different genres. Dan Abnett I’ve followed from comics to Warhammer 40K. Stephen King from his Dark Tower series to his short stories….Oddly, I have a bunch of to reads that follow authors to different genres. Like Jim Butcher and his upcoming steampunk endeavor. I love it when an author is polygenrous! Some of my favorites are! I personally think there is nothing wrong with writers branching out and giving other genres a shot. I would gladly follow an author across multiple genres, and across multiple series. I have definitely had my experience with authors who write multiple books that have been either hit-or-miss for me. But, it does not cause me to lose faith in that author, nor does it keep me from enjoying the better parts of their work. Also, I must add, regardless of the results of this giveaway, I will still be getting a copy of Karen Memory for myself. I can’t wait to read it! I’ll be getting a copy regardless of the winner as well. I’m hoping to snag audiobook and Kindle versions. Thank you for a chance to win Karen Memory. For me, it depends on what I look for with that writer. If I love their characterizations, prose and voice, I will probably follow them across genres. If I think they excel at a particular genre, I may be reluctant to join them in an experiment. In the thriller field, Lee Child is an example. If he published a high fantasy novel I might not rush to get it. Elizabeth, you seem to do it all so I would have no trouble border-jumping with your books. Although there are definitely some stories/genres that I enjoy more, I find that it’s more often an author’s style and ability to weave a fascinating plot/world that makes me enjoy their work. I’d imagine that an author that writes cross-genre wouldn’t put me off too much, as long as his/her characters really shine. I will follow Neal Stephenson anywhere. He writes all kinds of weird, wonderful stuff, and does something different each time. I think this quality attracts me to an author–I get the sense that, with each new endeavor, there’s a whole background research project going on. It stands for an entire invisible book list that I haven’t read but that the author had to master to write a work delving into new territory. Not only is it impressive, but I think the writing gets better, too, the more an author plays around with genre. You go for it, Elizabeth Bear! Lila Mihalik, if you live in the USA, you win a copy of KAREN MEMORY!